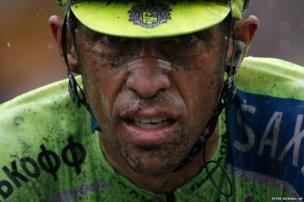 A selection of the best news pictures from the past week. Novak Djokovic described his Wimbledon win over Roger Federer as the "most special" of his career after it ended his losing run in finals. He is seen here celebrating his victory by eating a few blades of grass from the court. 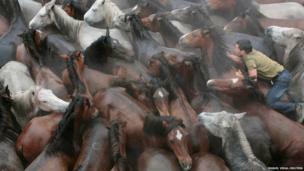 A reveller tries to hold on to a wild horse during the Rapa Das Bestas traditional event, which involves cutting the manes and tails of the horse, in the north-western Spanish village of Sabucedo. People dressed as soldiers of the Austrian Empire take part in the re-enactment of the historic Napoleonic march from Seefeld-Kadolz, Austria, to Dobsice in the Czech Republic. 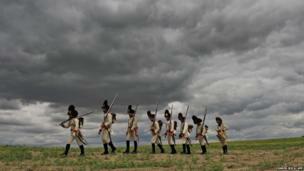 Over two days, amateur actors marched the 12 miles (20km) to commemorate the 1809 Battle of Znojmo. Members of the al-Kaware family grieve during the funeral for seven relatives killed in the Gaza Strip. The father, a member of the Fatah movement, and his six sons were killed by a Israeli air strike, one of hundreds since an operation began on Tuesday to stop rocket fire from Gaza. Here Israelis take cover in an underground car park in the coastal city of Tel Aviv during a rocket attack by Palestinian militants from the nearby Gaza Strip. 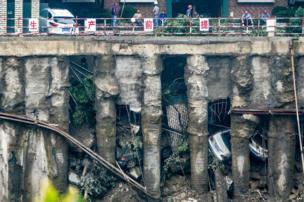 Cars are buried in the rubble after a car park collapsed into the supporting structure of a construction site in Chengdu, China. US President Barack Obama jokes with patrons as he orders at Franklin Barbecue in Austin, Texas. Austin was the final leg in a three-city trip before he returned to Washington. 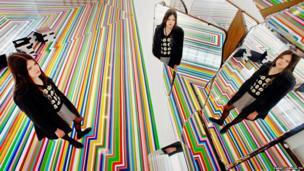 Sasha Panyuta views work by artist Jim Lambie on show at The Fruitmarket Gallery in Edinburgh, Scotland. 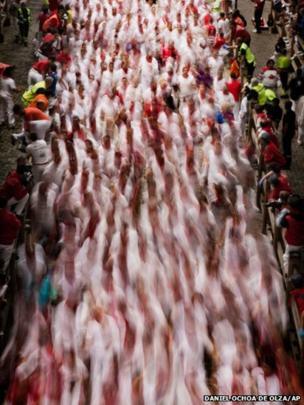 The San Fermin festival opened with the annual bull run through the cobbled streets of Pamplona, Spain. Five half-tonne charging bulls and six steers tore along a winding 850m course in just under two and a half minutes, injuring five runners. 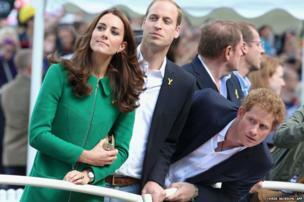 Earlier in the week the Duke and Duchess of Cambridge and Prince Harry joined thousands to watch the first stage of the race, which began in Yorkshire, England. Brazil's World Cup dreams ended in humiliating and brutal fashion as Germany inflicted their heaviest defeat in the semi-final in Belo Horizonte. 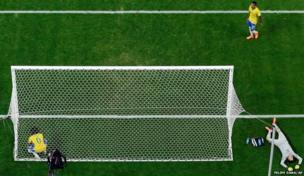 Germany were 5-0 up inside 29 remarkable minutes and went on to win 7-1.